The Global Volcanism Program has no activity reports for Musuan. The Global Volcanism Program has no Weekly Reports available for Musuan. The Global Volcanism Program has no Bulletin Reports available for Musuan. Musuan volcano, also known as Calayo, is an isolated, low grass-covered andesitic-to-dacitic lava dome and tuff cone that rises to 646 m above flat farmland in the province of Bukidnon in central Mindanao. An eruption, consisting of a possible phreatic explosion that "burned everything around it," was reported by a Jesuit priest to have occurred four years prior to his 1891 visit, at which time strong solfataric activity prevented closer examination. PHIVOLCS reported eruptions in 1866 and 1867. A strong earthquake swarm occurred near Musuan volcano in 1976. There is no Deformation History data available for Musuan. There is no Emissions History data available for Musuan. 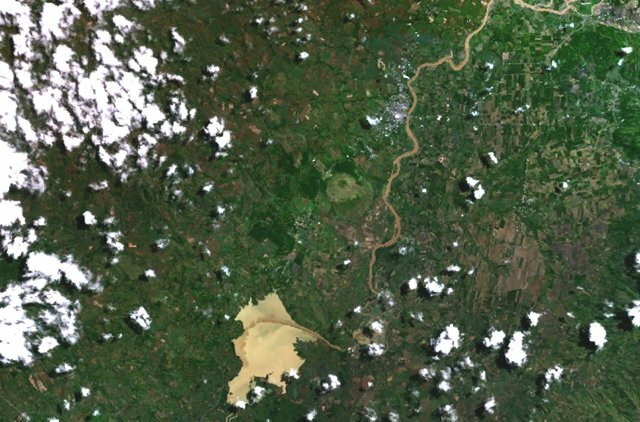 The small, circular light-green area just left of the river in this NASA Landsat image (with north to the top) is Musuan volcano. This andesitic-to-dacitic lava dome and tuff cone, also known as Calayo, rises to 646 m above flat farmland in the province of Bukidnon in central Mindanao Island in the southern Philippines. A single eruption was reported from Musuan in the late 19th century. 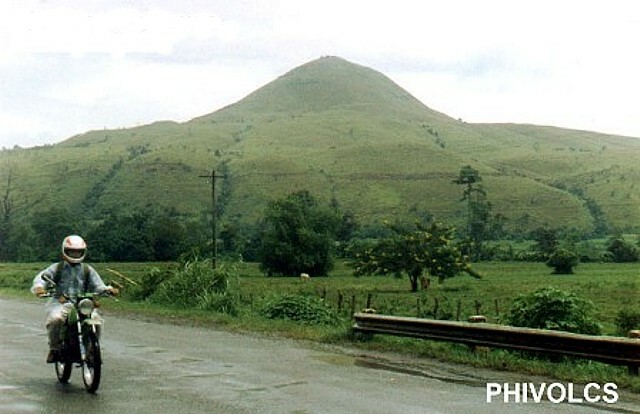 The grass-covered Musuan volcano, also known as Calayo, is an isolated, andesitic-to-dacitic lava dome and tuff cone that rises to 646 m above flat farmland in the province of Bukidnon in central Mindanao. A single eruption, consisting of a possible phreatic explosion that "burned everything around it," was reported by a Jesuit priest to have occurred four years prior to his 1891 visit. There are no samples for Musuan in the Smithsonian's NMNH Department of Mineral Sciences Rock and Ore collection. Large Eruptions of Musuan Information about large Quaternary eruptions (VEI >= 4) is cataloged in the Large Magnitude Explosive Volcanic Eruptions (LaMEVE) database of the Volcano Global Risk Identification and Analysis Project (VOGRIPA).